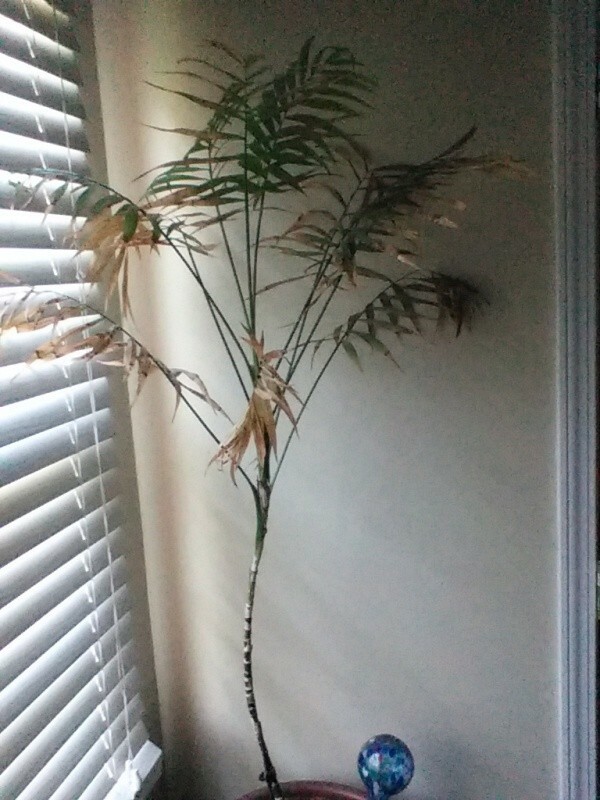 I've had this plant for many, many years. What kind of plant is it? Also, what is wrong with it? View the pictures to see what is going on. I water it every week, I've trimmed the dead leaves, etc. However, it continues to do poorly and the leaves keep dying. Help, please, save my plant! I believe this is a "Parlor Palm" By its "legginess" - it may not be getting the proper light and also the proper humidity by its brown leaves. These do best in bright light - not direct sun. 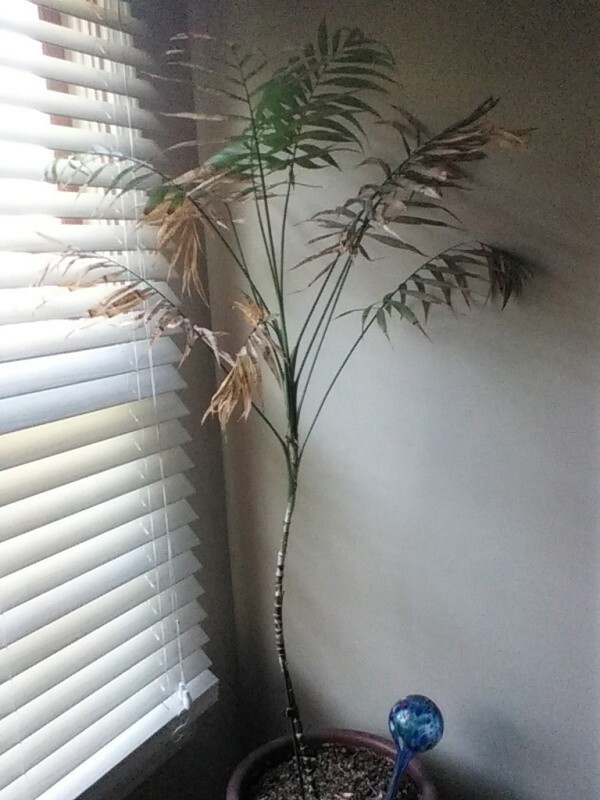 If it's a palm, and I agree it could be a parlour palm ( scientific name : Chamaedorea elegans or Neanthe bella or Collinia elegans) but whatever type of palm it is, the drying and dying of its lower leaves is its natural way to grow. The reliefs you see on the trunk of the very big palms that live outdoors or in the wild are what is left of their old leaves. These leaves should never be pulled off, but always cut off, but not right down to the trunk level, always by leaving a little bit of the old leaf. Whatever you do its older leaves will become yellow and then brown. Most of the time, indoors palms are parlour palms, because they are among the smallest but most of all, they grow very slowly.They are usually sold as a cluster of plants of different sizes so that people will enjoy a bushy plant for a longer time. Even if the browning of the lowest leaves is a natural process, it can speed up, if the plant is overwatered which, I think, your plant is. I think the first thing you should do is to take away the very nice self watering glass bulb, and any plate, if there is any, that could keep water at the level of the roots. You must also adapt the watering to the needs of the plant depending on the season. I think that watering every week when the light is low is too much for a palm. You can find here more information and you can also google its scientific name.